Can you tell us a bit about your career path and your motivation to follow this profession? I started my job as a translator for the Iraqi Parliament. During this time I had training courses that improved my skills, after which I got the position of the Director of External Affairs at the Public Relations Directorate at the Iraqi Parliament. I believed that through my relations with foreigners I will be able to make the picture clear to Iraqis to know that we have to open channels with them, trust them and enhance the relations between our people. I wish to be able to make all Iraqis know the benefit of being able to understand foreigners and how beneficial they are to us, because they really can help us to rebuild our country with new concepts of tolerance and acceptance of others. They could cooperate with the government to rebuild Iraq by making sure Iraqi interests and not personal interests are the main criteria and help build the Iraqi government on principles of transparency and anti-corruption. How much did you plan your current tasks to be as they are today and how much did you leave to chance? I am used to being a self-made person. Since the beginning of my professional career, I have been diligent and tried to get as much information as possible taking into account the laws and regulations of my country. During my experience with the Iraqi Government, from 2005 to present, I have been open to new trends and needs for my professional career as well as on a personal level. I found that the Iraqis problems are of a political nature. Further, I figuredout that the administrative side plays a crucial role in this issue as well. In addition to all of this, it is clear to me that social issues play a leading role too. I decided to study administrative affairs, I travelled to the United States of America and I got my MD in Public Administration with an emphasis on governmental affairs. From 2008 to 2010 Iwas Political Advisor for tribal leaders, as the tribes played a strong role in Iraq after 2003. I worked with International Republican Institution (IRI) and I was member of the Steering Committee for two tribal conferences. From 2012 to present I have been working with the Baghdad Provincial Council. I have also worked as a volunteer with Professor O'Malley who runs Forum for Cities in Transition citiesintransition.net/fct-personnel/fct-volunteers/. I worked from 2007 to 2008 with religious leaders and attended two conferences in Iraq and Copenhagen. I coordinated with Father Andrew, who is the President of the Foundation for Relief and Reconciliation in the Middle East. I made great efforts to understand better the many facets of the Iraqi political, governmental, religious and social structure. When it comes to influencing the international agenda or shaping public policies in your country, what main challenges do you face in your daily life as a professional? I wish that my concerns are heard by the leaders of the political process in Iraq. It is not easy to gain their attention. In my opinion, Iraq is no more than a flower on the agenda of other countries. It does not have real sovereignty with its decisions on the local, regional and international level. Unfortunately, I feel thatIraq is under the influence of other countries. Iraq has huge gas reserves in the western part of the country and so I wish that we could participate in solving the problems of global warming. Germany and its people are much respected in Iraq. Iraqis would be very happy to receive them and establish several projects with them. It would be good if our citizens could be made aware of the benefits of working with countries like Germany. Tell us about a pleasant “work” memory you have. The most pleasant memories I have are when I got married and then the births of our children Abdul and Jory. But these are of course pleasant memories of a personal nature. Work wise, it was when I was able to travel to Germany to participate in and successfully complete the seminar for International Diplomats held by the Federal Foreign Office in 2009. I recall the time spent by my wife and me in the USA while we did our masters there, to be very pleasant too. My wife did her master degree in Business Administration and in my view, she is cleverer than me! If you hadn’t followed this career, what other profession could you see yourself in and why? I started my working life as a store owner with my brothers in which I was very successful. I have also worked in the car business. I would have liked to be a successful business man in the private sector, but the current Iraqi law does not permit the start of new business. I wish to be a leader for the young Iraqis and lead the people in a modern trend and quit when I become old, to allow the way for the younger generation. I would like to see women in Iraq having more rights and being given the opportunity to hold powerful positions. The women of our country suffered a lot and they really deserve to play a leading role in a new Iraq. I could see myself at a position in the United Nations to be an advocate for democratic values and principles, human rights and the rights of women and children. How do you think our alumni network could serve your purposes better? The alumni network can help me to get in touch with government employees of other nations and we can share and exchange our experience on how to deal with certain issues that can help us find solutions to our countries problems, for example how we can improve the education system in Iraq, or maximisethe use of our oil and gas resources? How would you be willing to participate in our network? 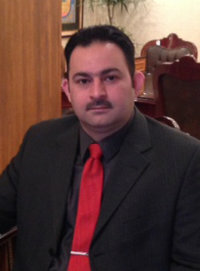 I am ready to participate in this network by establishing an office for the local forum here in Baghdad. This forum can provide Iraqis with training to spread public awareness of international issues, provide them with information on Germany’s experience of how it rebuilt itself from ashes and how the positive intervention in Germany enabled it to stand up again and reestablish itself. The experience Germany made is a very real and valuable lesson that all Iraqis could try to grasp and learn from. Germans had to learn new skills to be able to rebuild their country. Iraqis could benefit from this experience and learn how to be able to go through win-win negotiations in order to build a new strong country. We have to realise the importance of making the best choice for the country. I can participate in a forum that may be held in the future as the representative from Iraq to talk about the Iraqi political system, or economic and social issues here. I could work for the forum as a volunteer by organising a forum meeting in Iraq or any other suitable country. Finally, I wish to be a founder member in this forum and to have a leading position to develop this forum and make it a successful event in a global context. Die Interviews geben die Meinung der interviewten Alumni wieder und nicht die der Internationalen Diplomatenausbildung/des Auswärtigen Amts. Das Auswärtige Amt und die Inetrnationale Diplomatenausbildung sind nicht verantwortlich für den Inhalt der Interviews.